InternFeel: Hello Manish, please tell us about yourself. What makes you different? 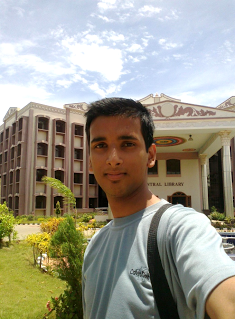 Manish: I am an Aerospace engineering student at IIST. I have just entered into 2nd year of my B.Tech course and in 3 years from now I will be a Scientist/Engineer at ISRO. Frankly telling this was not what I wanted to be. In fact, I don’t know what I wanted to do, may be an entrepreneur or at least this fascinated me. Let me tell u something, I could have been here at IIST one year ago. But I chose to study CSE at NIT-Trichy and above that continued preparing for IIT. I cleared IIT twice and still couldn’t make through a good branch. However, I was happy as I could do this along with managing my college where I got a pretty good GPA. I had 2 options now, either continuing at NIT-Trichy or joining IIST. I was confused, but there was something which was telling me to join IIST, may be the fear of being left behind by my batch mates at NIT. Everyone told to continue as a year was already over, but I decided to do otherwise and joined IIST. I would take this opportunity to thank my mom who always supported me, no matter what I did. All said and done, I am happy with whatever happened, it made me a stronger person and guess what now I feel this is the branch of engineering perfect for me. Manish: I would call it a project especially because I was doing it at my college itself, at IIST, Trivandrum. I tried to get internships in start-ups but couldn’t as I had just finished 1 year at college. Then I planned to do a summer course in Robotics and embedded system as I really wanted to do something as I always felt bad about wasting a year. One day I came to know that Aero Club of my college announced summer projects for 1st and 2nd year students. I applied and luckily got the project of RC Ornithopter under HOD Aerospace Department of my college. It was a group project where we had to design an ornithopter (a bird) and study about the flapping wing flight. It was a one month project in summer vacations but because it was in my college I had an option of continuing through the semester. It was sponsored by the Student Activity Board. I didn’t know anything about the project but I was excited about the fact that I’ll actually do something. Manish: About this project I came to know from my college fb group, quite obviously but yes, I keep myself connected to organisations like internshala, hello intern etc. and various other facebook pages like eduinfo. I also regularly visit websites of organisations where I would like to do internship like airbus, B/E aerospace etc. IF: Let’s talk about how competitive is the selection process.What qualities of yours, you believe helped you in having an edge over the selection process? What key things you feel were looked for by the selectors? Manish: As people would imagine that selection process here wouldn’t have been very tough and I’m not saying they are wrong but it wasn’t too easy either, at least to get the project you wanted to do I am a genius and that’s why got this project (just joking :P). Actually, I was one of the 3, first year representative of Aero Club and I had given a talk on Evolution of F1 in my 2nd semester which people liked, or at least they applauded my efforts. I was really sure about doing a project and may be they felt that I will do it. Manish: Well, there was no celebration as such but trust me I was really excited. It was probably the best thing that happened to me in last couple of years. I called my mom and told her about this, too much of my surprise she didn’t look happy because I will be going back early to the college. Though later on she told me that, you will do well. Manish: Well, about preparations we went through designs that people have used across the world. Design of wings, mechanism etc. However, there wasn’t much info on internet about my topic, flapping wing flight. Theory was really tough for us as we just had completed one year. But I didn’t worry much as my mentor was just an awesome person. He himself is extremely interested in the way bird’s fly and he could transfer that excitement into us. We read a lot about bird flight and I can say one thing, even a lifetime of study is not enough to understand the way bird’s fly. It’s amazing. Non-academic preparation, I would say nothing in my case. IF: Manish, could you please highlight us with what work/research project you carried out during the internship period? It’s application in near future and your work in it? Manish: The best part was that our mentor treated us like his mates and discussed things with us. There was a professionalism and we had access to labs where we did everything on our own. We had freedom to try out our ideas. We got all the support we needed. Manish: Special events…I would say the best time was when I was cutting gears and start singing and didn’t realise that everyone was listening 😛 And one day I was looking at bird and thinking how it twist and turns its wings. A thought came to my mind, everyone can see a beautiful bird in sky but I can see more than many of them. I felt joy all around me that time. IF: What was the guidance provided by your guide? What all support you received from IIST administration? Manish: As I told our mentor treated us as his mates. He discussed things with us about which we had no idea and yet made us feel comfortable, took the pain of making us understand things. He polished our ideas and was there as and when we needed him. IIST administration was extremely helpful as they provided accommodation and food free of cost. All the logistics for the project were taken care by Aero Club. Manish: Frankly telling doing a internship in an institutions like IIST, you don’t have to worry much about food, accommodation and safety as we did all our work in college, under guidance of our mentor and many other people around us. It was a homely feeling (don’t know if that word makes any sense). However, I would suggest everyone to be safe when you visit cities especially if is a new place for you. Manish: I believe every child should have a basic engineering course at their house. I mean they should get used to doing small thing like hammering a nail, fixing a bulb, soldering etc. I never did any of these as I have an elder brother who did everything. Because of this I had to think a lot before I took up the project. However, now I think I can take up anything I want. Manish: I would like to thank my group mates, Aero Club-IIST, Student activity board and Technical Committee- IIST for this wonderful opportunity and all the support. My special thanks to my mentor Dr. Kurien Issac, the most humble person I have met. I would also like to thank Dr. Sooraj for his valuable guidance in the lab and everyone who helped us in this project. Manish: Now, I feel I am ready to take up any challenge. Though I have learnt a lot academically but it’s more about the mind-set I have now. Manish: Well I would say, have faith in yourself and don’t be afraid if you haven’t done anything in past. There is always a first time. Do a good literature survey. Don’t stick to conventional ways as it the the best time to put your ideas into practice. You don’t have to worry about anything even failure. My mentor said ‘If u get it in first time, it doesn’t mean that you are good, it just shows that you got lucky’ and above all I would say be proud of yourself but keep ego away from you. Respect other’s ideas and give a thought to them before ignoring them. Believe that you can do anything but also trust people around you. All the best. Manish: Right now I’m continuing with it as I said it is a never ending thing. I will start working on EGR technique to reduce NOx emission. I am just into my 2nd year, so my aim is to explore as many things as possible and find purpose of my life. I mean I really want to do something for this society. This internship has made me a better student. It made me realise that all the big things have been derived from nature. It is the biggest open source organisation and it depends on you, how much you can extract and that’s all… you can understand how important the first internship is. Manish: It’s an excellent initiative I must say. I always enjoyed reading about people and their experience, especially with people with whom I can relate myself and I can sum it up by saying “learn from mistakes and experiences of others as you cannot do all of them yourself”. IF: So Manish, we are at the end of the interview. From the entire team of InternFeel, we thank you for sharing your experiences with us, for everyone and we wish you best of luck for all your future endeavors. Manish: Thanks a lot and trust me…. Pleasure was all mine. I had a wonderful time sharing my experience and views. I will be extremely happy if this interview helps even one person. It was a wonderful opportunity for me and hoping to share many more experiences in future. Thank You.